Here we are, just under a week until Christmas. Only days from my family’s Annual Christmas Cookie Bake-off. Every minute, our kids are spouting off about how excited they are for that jolly St. Nick to make his presence. Yet, the joys of the season have been taken from us, as our country mourns for the victims of the Sandy Hook Elementary shooting. Since Friday, I have had posts planned. I have had ideas that just get swept away from my head, because I just can’t imagine writing and talking about happy cookies. Not when I’m so saddened for these families as they are forced to suffer during this holiday season. One thing I have learned though in my 29 years, and believe me, I have had some rough times in there – Life does move forward. Despite heart-ache. Despite pain. Despite depression. Despite war. Life moves forward, and we just have to ask ourselves if we are going to move along with it or let it leave us behind in the dust? I know many of you have children who probably don’t understand the sadness we are feeling. All they know is that Christmas is right around the corner, and cookies need to be made for Santa Claus! So for your kids. And for yourself. Let’s provide some normalcy in our lives just to make sure life doesn’t keep going on without us. Hang on for the ride. You can still be sad. You can still cry. But go along with the motions, hugging your babies just a little bit tighter each day. Celebrate Christmas as you normally would. Sing carols, go look at Christmas lights, and please please make these cookies! If nothing else, make this twist on an American classic in memory of the innocence of those lost in tragedy. These chocolate cookies on their own are so delicious. They’re super soft in the center but have a slight crunch that just keeps everything interesting. And oh my, the cool minty cream center. So tasty. It’s not too rich. It’s not too light. It’s really all you could ever ask for in a homemade version of America’s favorite cookie. I’m pretty sure Santa would be happy with a stack of these tasty treats left out for him this year! Heat butter, sugar, and water in a large saucepan over low heat. Add chocolate chips and stir until melted. Add dry ingredients and beat in eggs. Drop by teaspoon onto cookie sheet. Bake for 10-14 minutes. 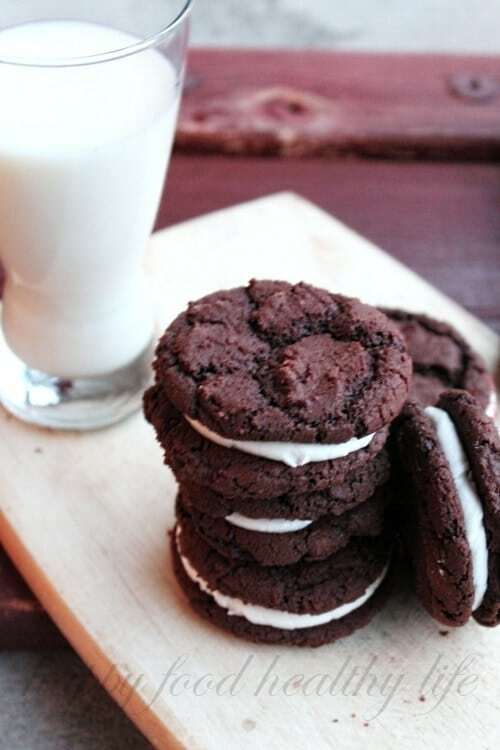 After cookies have cooled, sandwich 2 cookies together with cream filling. Blend 1 cup powdered sugar with butter and peppermint extract. Beat in remaining powdered sugar and milk alternately. 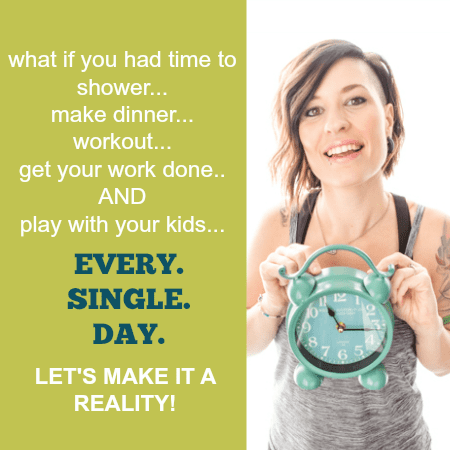 With all the above said, I am very much in tune with my motherly instinct to spend as much time with my son and my family this holiday season as I can. Between now and the New Year, my posts may be sporadic. This is a time for family, and I am sure you will understand. If we don’t meet between now and then, I hope you have a lovely holiday with your loved ones. I hope you are not struggling in any way. Please do not hesitate to contact me if you are seeking comfort or assistance in any way. I will still be around! And in the meantime, if you haven’t signed up for my newsletter, where I send out exclusive information through email that you won’t get anywhere else on the blog or the Facebook page, please make sure you do that now! Of course, if we’re not facebook friends yet, let’s change that! This is where I update the most and will probably be there more than here in the next 2 weeks. I know people go crazy over Oreos, but I’ve never been a huge fan. These look a million times better to me! 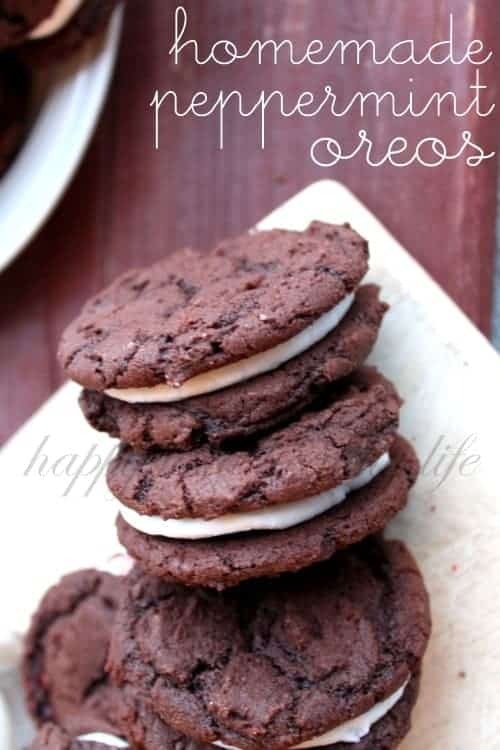 I love homemade oreos…and I love that you filled them with peppermint!!! Perfect Christmas cookie!! Gorgeous photos and the cookie sounds divine! Pinning! Thank you so much. I hope you try them out yourself! These are AWESOME!! I want them now! Thanks so much for sharing on Two Cup Tuesday at Pint Sized Baker. I’ve Pinned this! no, thank YOU for hosting! 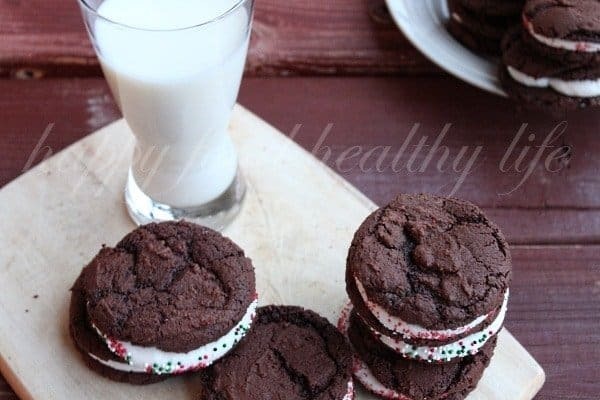 I could absolutely go for a homemade peppermint oreo right now!